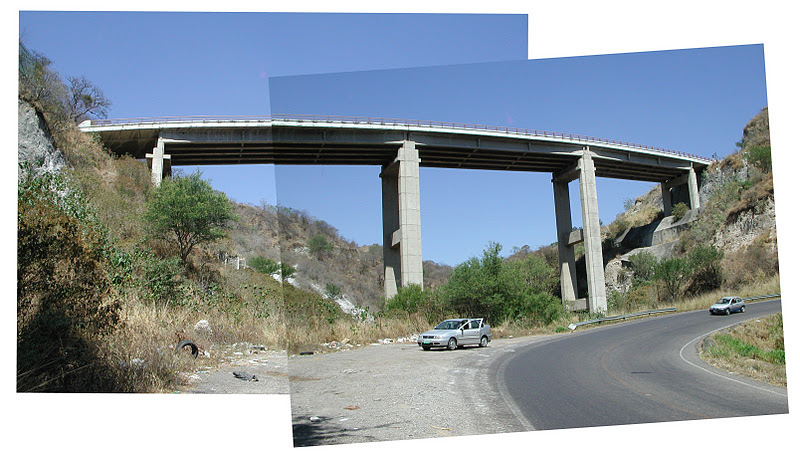 This bridge is near the intersection of roads going to Tuxpan, Ciudad Guzman, Tecalitlan, and Colima, hence the name Cuatro Caminos. Puente Cuatro Caminos has three precast I-girder spans and short slab end spans. I wonder why they needed the little end spans? It looks like the girders and the deck are simple spans, but they covered the deck (including the expansion joints) with asphalt so the bridge looks continuous from the road. The I-girders are supported by large two column bents. Note that the top of the bents have wide platforms, perhaps for jacking up the spans and replacing the bearings. Route 54D continues another 80 miles to Guadalajara, but I turned around at this point and returned to Colima. Mexico's Bridges: Puente Cuatro Caminos (2) by Mark Yashinsky is licensed under a Creative Commons Attribution-NonCommercial-ShareAlike 3.0 United States License.